Colombia's president has warned of an unfolding "humanitarian crisis" on the border with Venezuela. Nearly half a million Venezuelans have fled to Colombia to escape economic deprivation and a crackdown on dissent. 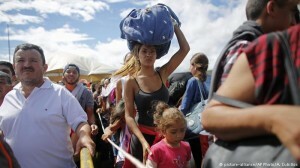 BOGOTA - UN Secretary-General Antonio Guterres has offered Colombia more resources to manage a migration crisis that has seen nearly half a million Venezuelans pour into the Andean country. According to government estimates, Colombia has received more than 470,000 Venezuelans, many of them fleeing chronic shortages of food, medicine and other basic goods amid a major economic downturn. "Colombia is suffering the impact of the presence of hundreds of thousands of people leaving Venezuela," Guterres said during a speech in Bogota on Saturday. "I want to express all the support of the United Nations to the government and people of Colombia in this humanitarian effort, the reception of all these people, and say that we are even willing to mobilize other international help as is possible." Colombian President Juan Manuel Santos said the regional crisis fueled by an authoritarian turn in Venezuela "has enormous repercussions" for the region. "The UN can bring experience to this humanitarian crisis," said Santos. "Any help will be welcome." The Colombian president also reaffirmed his country's offer to provide humanitarian support to Venezuela, a proposal rejected by Venezuelan President Nicolas Maduro. Colombia and Venezuela have been at odds since global oil prices tumbled, sending the latter's economy into a nosedive. Maduro has accused Santos of belonging to an international plot aimed at unseating him, an allegation the Colombian presidency has yet to entertain. Guterres is in Colombia for a two-day visit aimed at reviewing a peace deal between the government and the disarmed Revolutionary Armed Forces of Colombia (FARC) and talks with other armed groups.